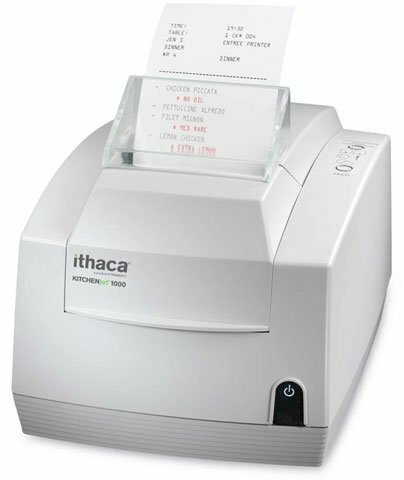 It is replaced by the Ithaca POSjet 1000. Inkjet, 2 Color, 802.11b Wireless interface, Auto-cutter and Buzzer. Includes US power supply. Order cables separately, see accessories. Inkjet, 2 Color, USB interface, Auto-cutter and Buzzer. Includes US power supply. Order cables separately, see accessories. Inkjet, 2 Color, 9-pin Serial interface, Auto-cutter and Buzzer. Includes US power supply. Order cables separately, see accessories. Inkjet, two-color, receipt printing, 12 lps, 25-pin Serial interface. Includes auto-cutter & power supply. Order cables separately. See accessories. Color: white. Inkjet, two-color, receipt printing, 12 lps, parallel interface. Includes auto-cutter & power supply. Order cables separately. See accessories. Color: white. Inkjet, two-color, receipt printing, 12 lps, Ethernet interface, Auto-cutter and Buzzer. Includes US power supply. Order cables separately, see accessories. Two Color (Black and Red) Inkjet Kitchen Printer, USB interface, Auto-cutter and Buzzer. Includes US power supply. Order cables separately, see accessories. Two Color (Black and Red) Inkjet Kitchen Printer, 25-pin Serial interface, Auto-cutter and Buzzer. Includes US power supply. Order cables separately, see accessories. Two Color (Black and Red) Inkjet Kitchen Printer, 9-pin Serial interface, Auto-cutter and Buzzer. Includes US power supply. Order cables separately, see accessories. Two Color (Black and Red) Inkjet Kitchen Printer, 36-pin Parallel interface, Auto-cutter and Buzzer. Includes US power supply. Order cables separately, see accessories. Two Color (Black and Red) Inkjet Kitchen Printer, 25-pin Parallel interface, Auto-cutter and Buzzer. Includes US power supply. Order cables separately, see accessories. Two Color (Black and Red) Inkjet Kitchen Printer, 802.11b Wireless interface, Auto-cutter and Buzzer. Includes US power supply. Order cables separately, see accessories. Two Color (Black and Red) Inkjet Kitchen Printer, Ethernet interface, Auto-cutter and Buzzer. Includes US power supply. Order cables separately, see accessories.